These forearms utilize our anti-rotation screws to insure that the forearm stays solid even under strenuous use. Perfect for use with forward grips and optics. Features include: mounting points for our Swiveling Sling Studs (YHM-9469), Mil. Spec. Picatinny rails, and they accept our Forearm End Caps. The barrel nut and forearm tube are made of aircraft quality aluminum and hardcoat anodized to Mil. Specs. The jam nut is made from steel and plated a matte black to match. All assemblies include: one jam nut, one barrel nut, 2 anti-rotation screws, and one forearm tube. 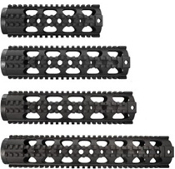 Carbine-Length SKU: YHM-9631. Overall length: 7.2 inches.Weight 10.6 oz. Mid-Length SKU: YHM-9634. Overall length: 9.2 inches.Weight 12.4 oz. Specter-Length SKU: YHM-9638. Overall length: 9.675 inches.Weight 12.9 oz. Rifle-Length SKU: YHM-9636. Overall length: 12.5 inches.Weight 14.75 oz. Note: This item has been discontinued by the manufacturer. Once we run out of stock, we will not receive any further inventory.